Now, you’re probably asking why I’m even talking about CyberPowerPC’s system naming scheme. Well, that’s because today we’ll be reviewing a brand new system from CyberPowerPC, which they’re calling the Zeus EVO Lightning 2000 SE, which if you think about makes little to no sense at all, but does sound pretty damn cool. That said, CyberPowerPC has definitely done the Zeus EVO Lightning 2000 SE justice, as the name does in fact reflect on the system itself. 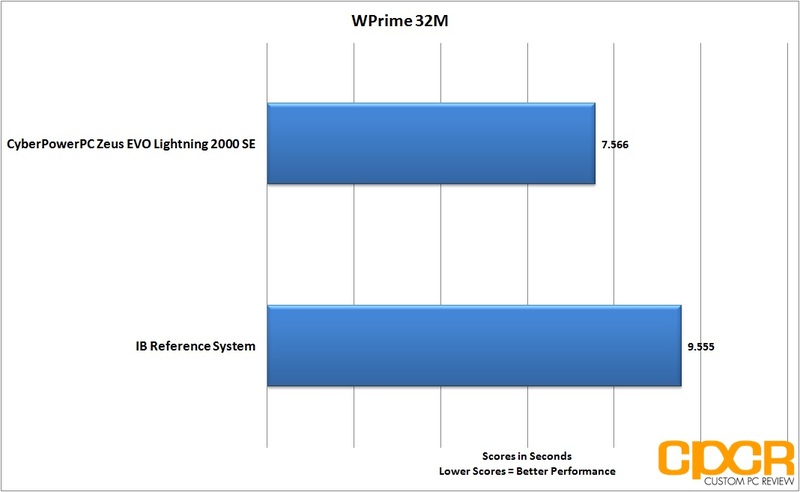 What’s special about the Zeus EVO Lightning 2000 SE is that it’s completely an AMD powered system, which we’ve seen very little of as of late with most systems coming in as Intel based systems, but here’s the kicker…. What’s truly exciting with the Zeus EVO Lightning 2000 SE is that it’s coming equipped with AMD’s latest FX-9590, which is an 8-core, 4.7GHz processor capable of turboing up to 5GHz right out of the box. With the entire tech industry seemingly focused on power efficiency and all that green nonsense, it’s actually quite awesome to see AMD releasing a product that’s really capable of pushing their existing Piledriver architecture to the absolute limits. Of course for a proper gaming PC, you’ll really want to have a high end GPU to complement that CPU, which is why the Zeus EVO Lightning 2000 SE also includes AMD’s flagship Radeon HD 7000 series GPU, the Radeon HD 7970 for good measure. Intrigued? Read the specs and flip the page to see how the Zeus EVO Lightalkdfdafjdjs performed! Moving right along, the CyberPowerPC Zeus EVO Lightning 2000 SE came double boxed in a large CyberPowerPC box, which included a case box for the CFI Borealight case as well as a Gigabyte 990FXA-UD3 motherboard box which contained all the accessories. 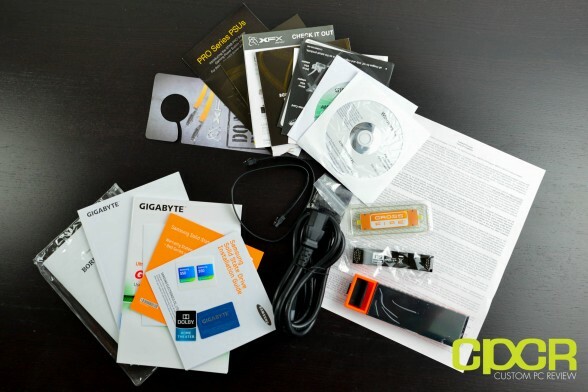 Digging into the accessories box first, we get documentation for all the major components onboard, cables, CrossFire bridge, SLI bridge, etc. 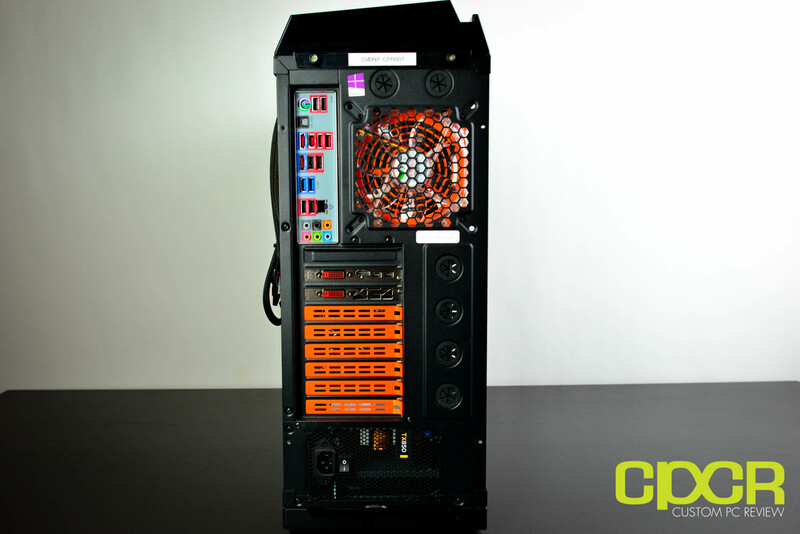 Moving on here, lets take a look at the actual CyberPowerPC Zeus EVO Lightning 2000 SE. For the Zeus EVO Lightning 2000 SE, CyberPowerPC went with the CFI Borealight full tower case, which is a case from a company I’ve personally never heard of, but the case looks decent with some very aggressive black/orange themed styling. Pulling off the sidepanel, it’s nice to see that CyberPowerPC used some moldable packing foam to ensure that the components inside don’t move around during shipping. Let’s take a look inside. Overall, we can see that CyberPowerPC has done quite a good job with the build as the insides look quite tidy and clean. 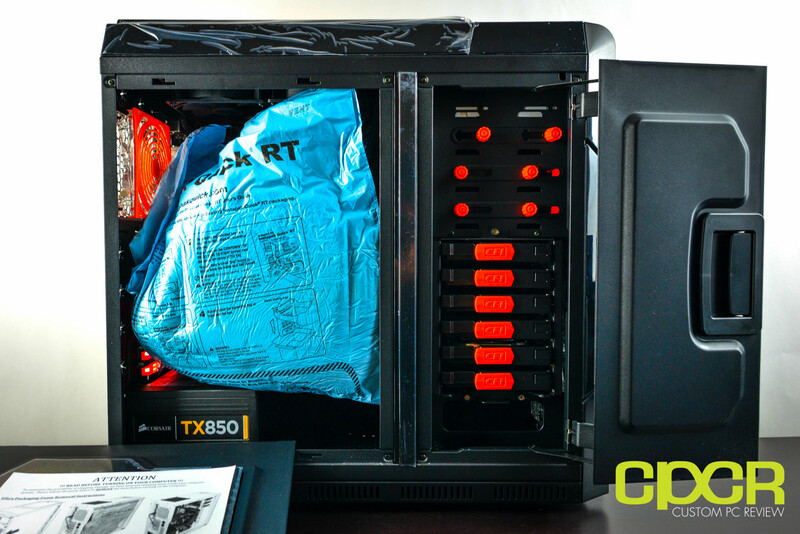 For cooling, CyberPowerPC opted to use the Asetek 570LX, which is an Asetek all-in-one watercooler with a 240mm radiator. This *should* provide adequate cooling for the beastly 8-core AMD FX-9590 processor which clocks in at 4.7GHz with a turbo clock of up to 5.0GHz. Not to be outdone by the powerhouse CPU, CyberPowerPC also dropped in a XFX HD7970 3GB graphics card, which is AMD’s flagship 7000 series single GPU graphics card. 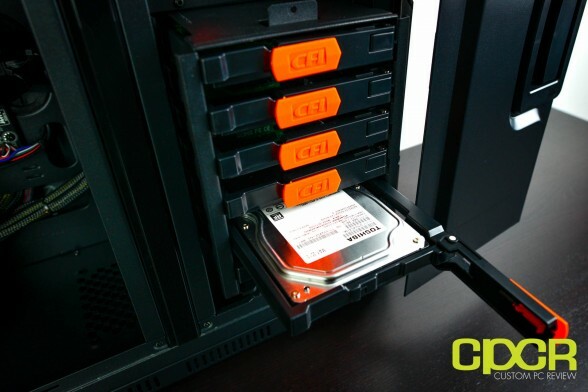 For expansion, the CFI Borealight case comes equipped with 6×3.5″ drive trays, one of which includes a Toshiba 1TB 7200RPM traditional hard drive. Flipping around to the back here we can see that cables are once again nice and tidy although with the amount of cable management space CFI left for the Borealight case, I would’ve gone with a modular power supply or a better case with more cable management space. While the sidepanel does close with a bit of elbow grease, it’s tricky as there’s simply too many cables crammed back here with too little space. At the top near the optical drive bays, there are 2×2.5″ drive mounts, one of which includes the 120GB Samsung 840 SSD. Moving around to the top of the case, we get the top I/O panel for the case. This is especially nice if the case is sitting on the floor as it allows for easy access to the buttons and the ports here. Here we can see that we get 2xUSB 3.0 ports, 2xUSB 2.0 ports, a headphone and microphone port, power button, reset button, and fan up/down buttons as well. There’s also a couple lights up here that indicate the machine is on as well as a fan speed indicator and a HDD activity indicator. 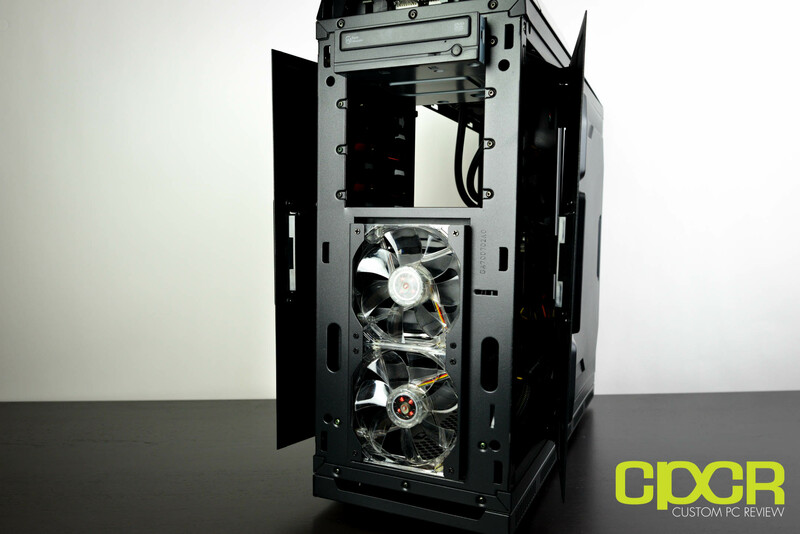 Pulling off the front panel of the case, we can take a closer look at the front cooling fans here. We can see that the CFI Borealight includes 2x120mm fans which serve as the intake fans for the system. Unfortunately, larger fans cannot be mounted here. Here’s a look at the rear I/O for the system. 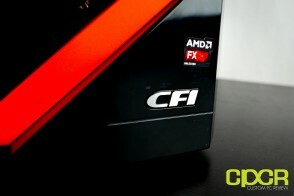 CFI has also included an additional 120mm fan back here which serves as a rear exhaust. Let’s continue. For reference, we’ll be using a decently equipped Ivy Bridge test bench for comparison with the Zeus EVO Lightning 2000 SE. Our IB reference system doesn’t necessarily represent the fastest PC on the market, but it’s a fantastic mid-range gaming PC capable of playing a majority of the latest games on the market at medium to high settings. 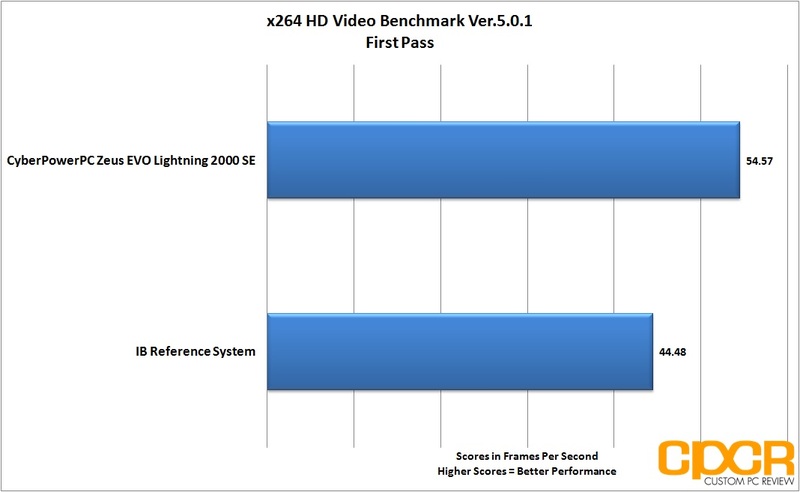 The specifications for our Ivy Bridge reference system are as follows. 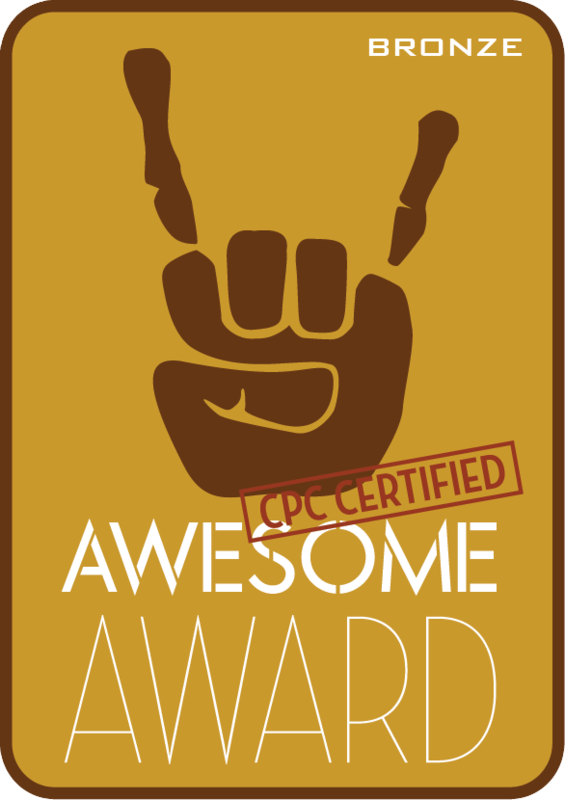 Special thanks to Gigabyte, Kingston, HIS and HSPC for sponsoring our reference system! 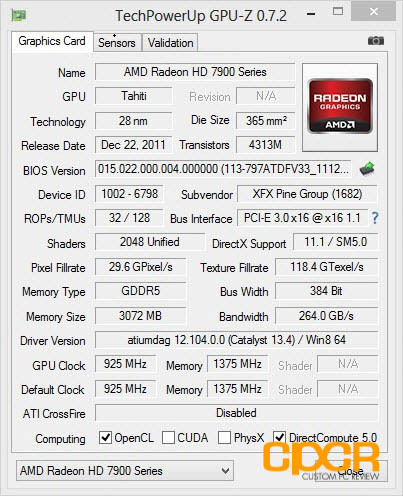 Starting off with the CPU-Z report, we can see that we’ve got AMD’s FX-9590 out of the box turbo clocked at a blistering 5.0GHz consuming an incredible 1.512v. Unfortunately, it seems like AMD hasn’t broken the laws of physics just yet as this much voltage can kill or reduce the lifespan of many of the latest processors on the market; however, the FX-9590 welcomes the extra power with a maximum TDP of up to 219w. True, it’s a lot of power for today’s standards, but the FX-9590 is an eight core processor clocked at an unheard of 4.7GHz with the capability of turboing up to 5.0GHz right out of the box. 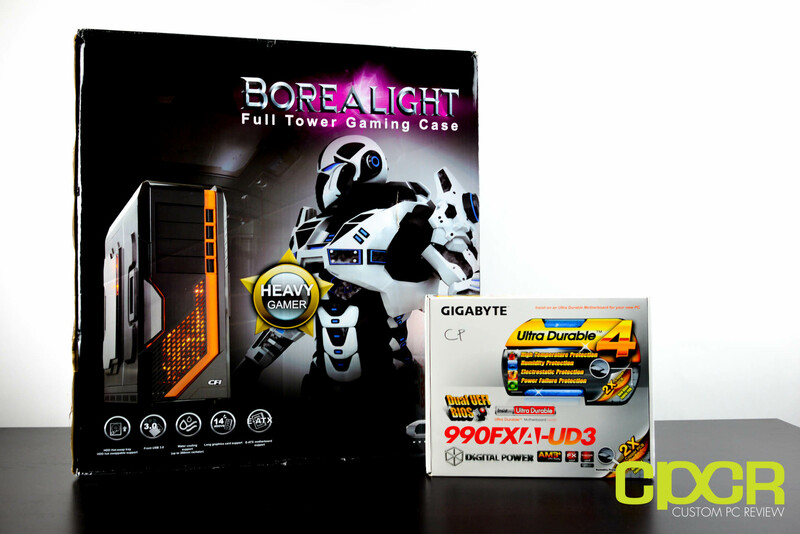 As for the motherboard, CyberPowerPC went with the more mainstream Gigabyte 990FXA-UD3 Rev 4.0 motherboard. While the board doesn’t necessarily feature all the bells and whistles of higher end boards such as the ASUS Crosshair V Formula-Z or the ASUS Sabertooth 990FX R2.0, it does come with all the base features contained within the 990FX chipset which includes support for up to 38 PCIe lanes for multi-GPU support and native SATA 6Gb/s. 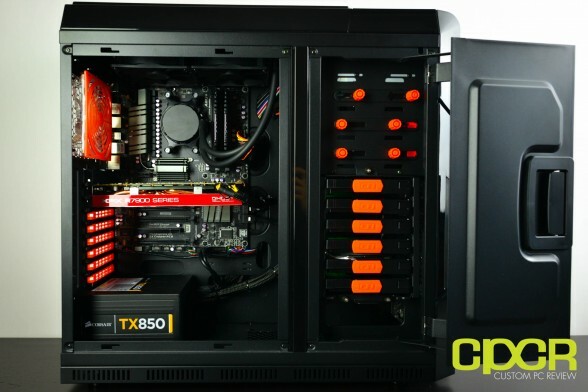 Additionally, CyberPowerPC also went with 16GB of Corsair Vengeance DDR3 1866MHz memory which comes in a 2x8GB configuration allowing for further expansion of up to 32GB of memory. 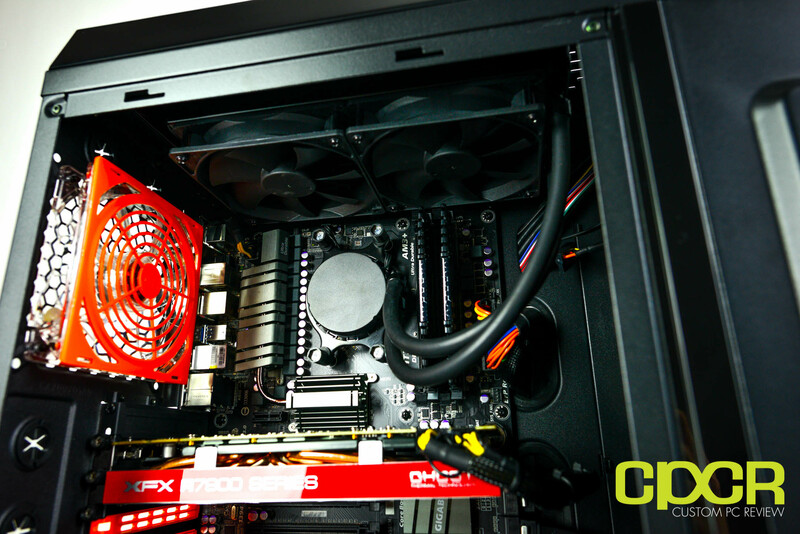 To complement AMD’s top end processor, CyberPowerPC also included AMD’s top end single GPU graphics card, the AMD HD 7970 3GB. Our particular unit came included with a reference card from XFX clocked at 925Mhz core and 1375MHz memory. CPU performance on the CyberPowerPC Zeus EVO Lightning 2000 SE was good, but was definitely not as good as initially expected. 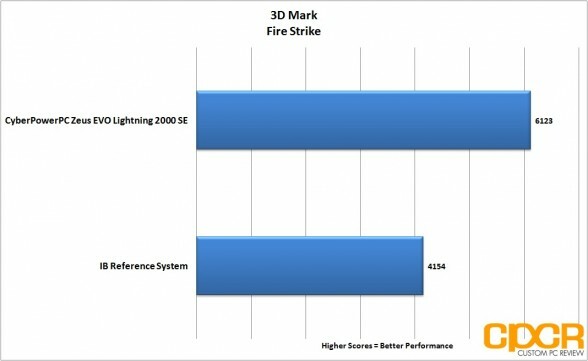 In comparison to our reference system, the AMD FX-9590 excelled in multi-threaded applications, beating the reference system’s Ivy Bridge based Intel Core i5-3570K in every multi-threaded benchmark. 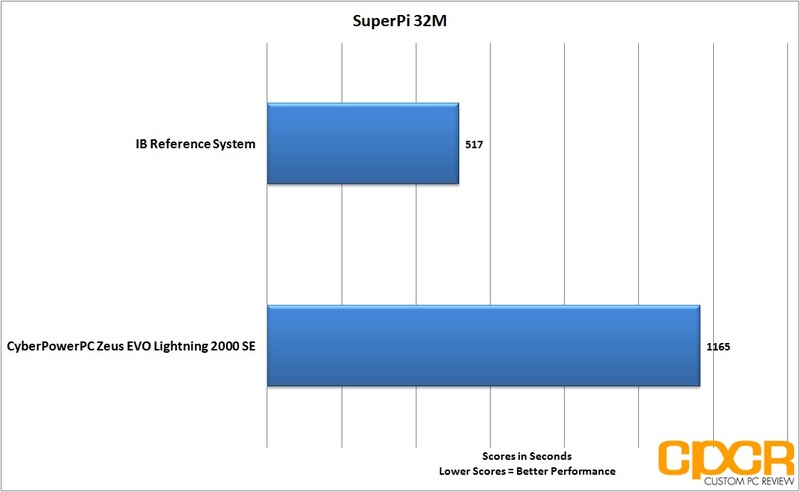 Unfortunately as seen in our SuperPi 32M benchmark, AMD still needs to work on single threaded performance as Intel’s Core i7-3570K defeats the FX-9590 despite the FX-9590 clocking in at 4.7/5.0GHz. Unfortunately, given the fact that the FX-9590 is already clocked at 4.7/5.0GHz, there isn’t much room for additional overclocking especially since the included Asetek 570LX liquid cooling system is already at its limits as you’ll see on page 8. As expected from a system carrying both AMD’s flagship CPU as well as AMD’s flagship GPU, the Zeus EVO Lightning 2000 SE excelled in our graphics benchmark suite, running every game tested today at maximum settings at 1920×1200 without any issues. Given the fact that our Zeus EVO Lightning 2000 SE is an extremely well balanced system with strong multi-threaded performance along with strong graphics performance, it’s no surprise that it excelled in our PC Mark 8 complete system benchmark, pulling ahead of our IB reference system in all three usage scenarios. For storage, the Zeus EVO Lightning 2000 SE is equipped with an ideal combination of the Samsung 840 120GB SSD + the Toshiba DT01ACA100 1TB 7200RPM hard drive. 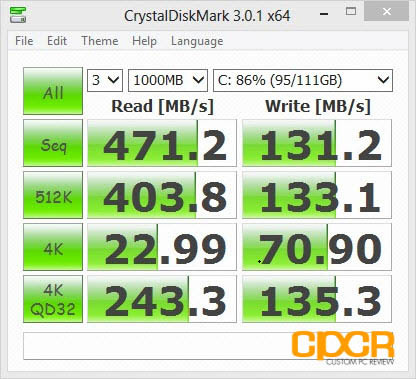 It’s nice that CyberPowerPC equipped their systems this time around with a 120GB SSD as this allows for just enough capacity to install Windows along with a couple games and applications to take advantage of the SSD’s blazing fast 4k and sequential read speeds. Despite 120GB being enough storage for a number of gamers out there who stick with one or two games, those with larger game libraries should opt for the 250/256GB+ SSDs. 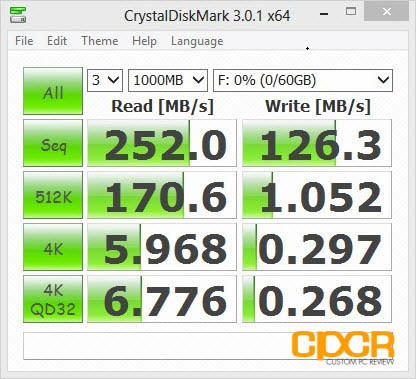 Only games and applications installed on the SSDs will allow the user to take advantage of the SSD’s quick read performance. 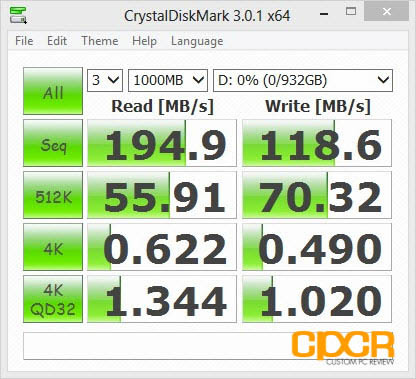 For USB 3.0 testing, I used the Kingston HyperX 64GB USB 3.0 Flash Drive. Performance here is slightly lower than what I’m used to seeing on Intel’s natively controlled USB 3.0 ports, but not by much. As AMD’s FX990 chipset doesn’t include native support for USB 3.0, USB 3.0 support is introduced via the 3rd party VIA VL805 controller. 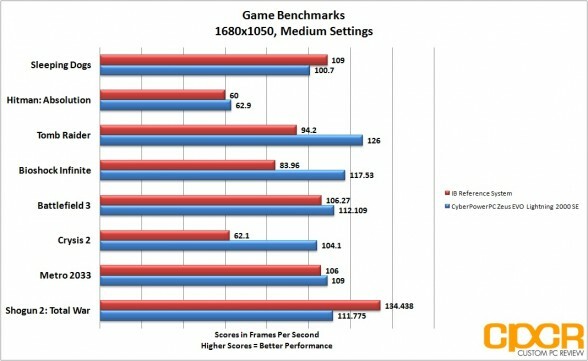 Can’t say this wasn’t expected, but the pairing of a 5GHz, 219w TDP processor along with a flagship graphics card does have its disadvantages and power consumption is certainly one of those diadvantages. Whereas our IB reference system’s Intel based i5-3570K paired with AMD’s mid-range Radeon HD7850 only drew 54w at idle and 184w at load, the Zeus EVO Lightning 2000 SE’s AMD based FX-9590 paired with AMD’s high end Radeon HD 7970 drew 88w at idle and a whopping 523w at load. 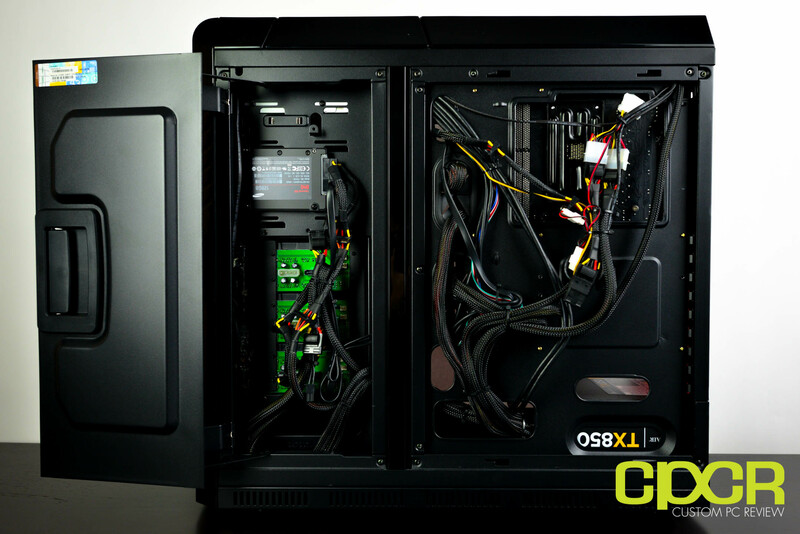 Fortunately, CyberPowerPC shipped our Zeus EVO Lightning 2000 SE with a Corsair TX850 850w power supply, which is slightly more than adequate for our system. Unfortunately with only a ~327w margin (efficiency not factored), I would not recommend upgrading the system with an additional HD 7970 unless the power supply is upgraded. Temperature testing is conducted by simultaneously running Prime 95 and Furmark in order to generate the maximum amount of heat possible. Temperatures are taken after a minimum of 30 minutes of testing. 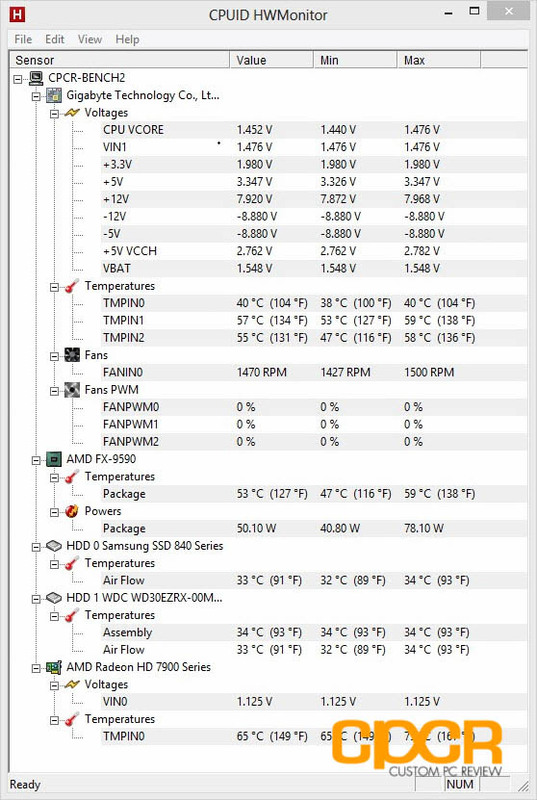 So normally we rely on HWMonitor for our temperature testing, but it seems like the Gigabyte 990FXA-UD3’s onboard sensors have some sort of bug with HWMonitor as it wasn’t reporting correct voltages and some incorrect temperatures, so I decided to also use the AIDA64 sensor monitoring tool as a reference for the stats in HWMonitor. 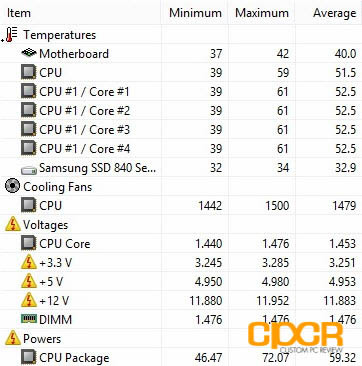 As expected from the high power draw of the FX-9590, the processor runs extremely hot with maximum load temperatures reaching a staggering 61°C. 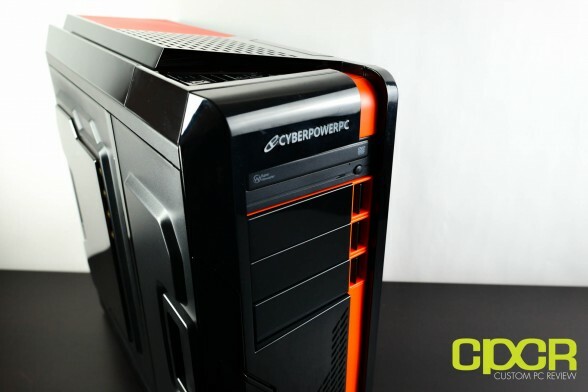 For this CPU, it seems like CyberPowerPC has taken the extremely high operating temperature into consideration as they’ve bundled the Asetek 570LX 240mm AIO water cooler with the Zeus EVO Lightning 2000 SE, which just barely keeps the FX-9590 from throttling under the scorching heat. As for the Radeon HD 7970, it was able to keep itself at a not too shabby 75°C. While 75°C would be catastrophic for the FX-9590 processor, GPUs tend to run warmer, which makes 75°C about right for the reference HD 7970. As for noise, for some reason CyberPowerPC doesn’t employ the use of any fans that ramp over 1,500RPMs, which means it’s pretty quiet for a system that’s capable of drawing so much power; however, I feel like noise performance should’ve been thrown out the door here for better cooling performance. The CPU was kept at near throttling temperatures with the weak fans and having more powerful 2,500RPM+ fans in a push/pull configuration on the Asetek 570LX would do much better for cooling than the currently included solution. Alright, so with testing out of the way, let’s talk about the CyberPowerPC Zeus EVO Lightning 2000 SE. 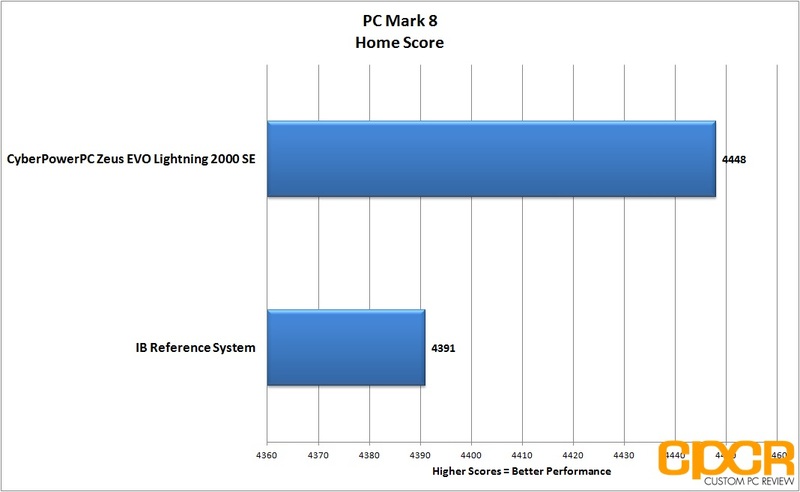 Now, for its intended purpose as a gaming system, I think the Zeus EVO Lightning 2000 SE is definitely a solid machine. It was able to run all of our benchmarked games at maximum settings at 1920×1200, and there really isn’t much to say beyond that. 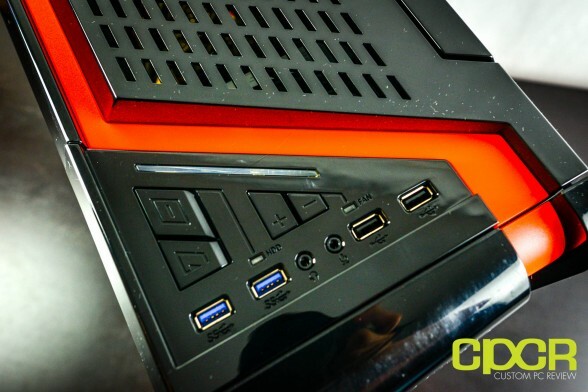 As for the processor, CyberPowerPC bundles the latest AMD FX-9590 with the Zeus EVO Lightning 2000 SE, which is one of AMD’s latest offerings. The major claim to fame for this processor of course is that it’s an 8-core processor running at a stock clock of 4.7GHz with a turbo clock of up to 5.0GHz right out of the box. Now as far as performance goes, we definitely saw competitive performance with the processor slightly nudging out the Intel Core i5-3570K in highly multi-threaded tasks. Unfortunately, the FX-9590 is still based off the Piledriver architecture, which means it’s still lacking in the single threaded performance department. 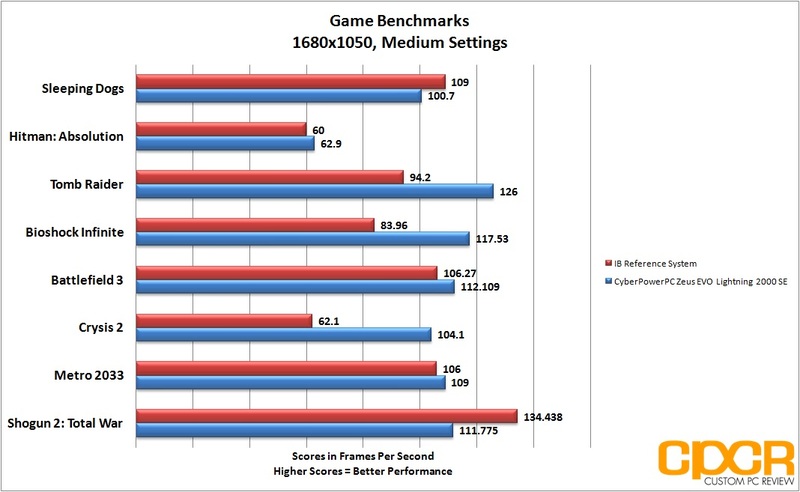 Despite the FX-9590 processor being a bit weaker on single threaded performance, it’s perfectly capable of running pretty much any game on the market today at maximum settings without issue as long as it’s paired with a decently powerful graphics card such as the Radeon HD 7970 included with our system today. Since many future games are being developed with parallelization in mind, multi-threaded performance is definitely going to play a bigger and bigger role in future games and applications. 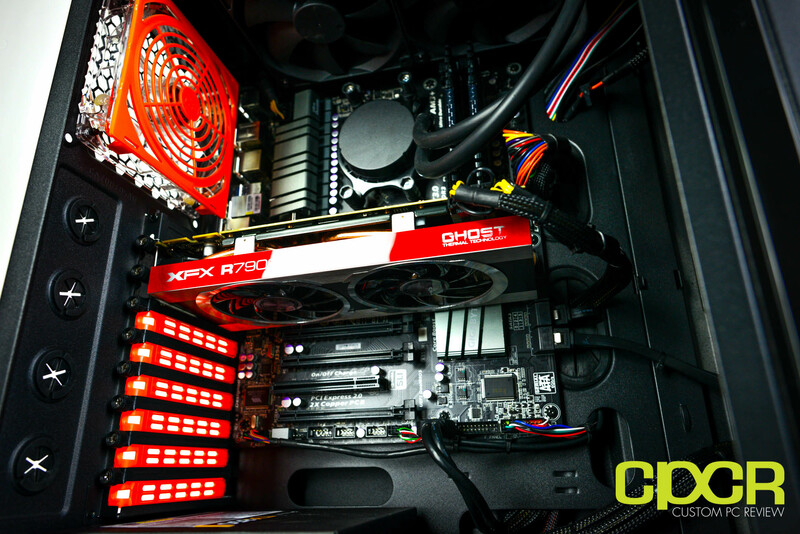 As for the GPU, CyberPowerPC went with the XFX Radeon HD 7970, which I think is a great choice for our system. 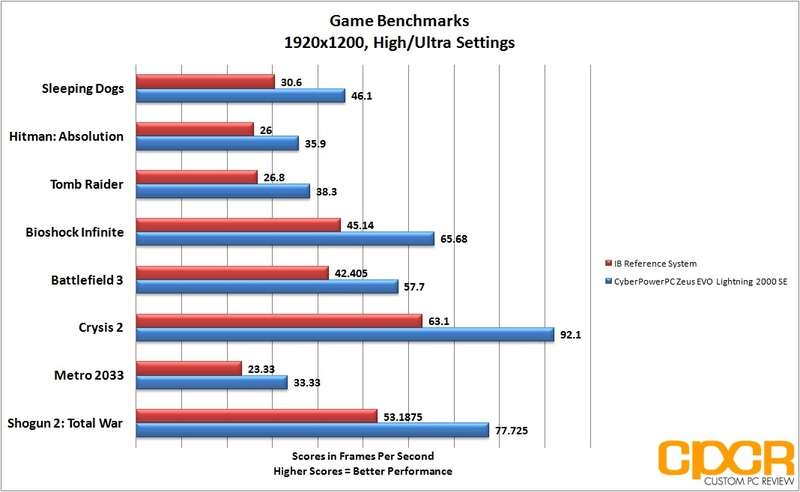 The HD 7970 was able to crank out impressive framerates across the board, delivering very playable framerates at 1920×1200 at high/ultra settings with a margin to spare.The combination between the AMD FX-9590 along with the XFX Radeon 7970 is definitely a powerhouse combination and I think those who end up with the Zeus EVO Lighting 2000 SE won’t be disappointed. Build quality on the Zeus EVO Lighting 2000 SE is quite good and cable management is done quite well too. This time around, I was also quite happy about the choices in components, which I think are much better balanced than what I’ve seen in past systems from CyberPowerPC. While our system today doesn’t necessarily claim the fastest or best components out there, they certainly work well together, which I think is most important for a good system build. Compared to times when CyberPowerPC sent out systems with measly 64GB SSDs and the like, I think this latest system configuration is pretty well thought out although I’d definitely like to see more attention paid to the cooling department, especially with a monster of a processor like the FX-9590. Speaking of things I’d like to see, I’d really wish CyberPowerPC went with a better case for our EVO Lightning 2000 SE configuration. While the CFI Borealight case certainly isn’t the worst case I’ve seen, it’s definitely not my first, second, or third choice in cases for a build like this. Something with high air flow from Corsair or Cooler Master would be a far, far better choice here, providing much needed cooling, thicker steel, more room for cable management and simply a more intuitive design. 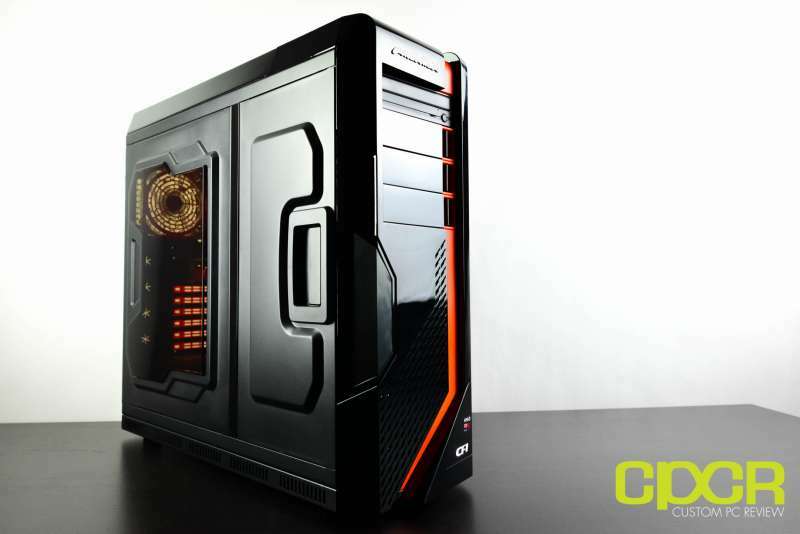 Luckily, it shouldn’t be too much of a problem for those looking to purchase this system as CyberPowerPC does allow full customization of all their systems including the case, so it’s only the small matter of selecting a different case at configuration. While not completely necessary, those interested in purchasing the Zeus EVO Lightning 2000 SE may also want to think about picking up a more full featured motherboard as well such as the ASUS Sabertooth 990FX or the ASUS Crosshair V Formula to better complement the higher end CPU/GPU combination. Additionally, those looking to drop in additional graphics cards for multi-GPU configurations in the future may also want to upgrade to a higher capacity power supply as well. 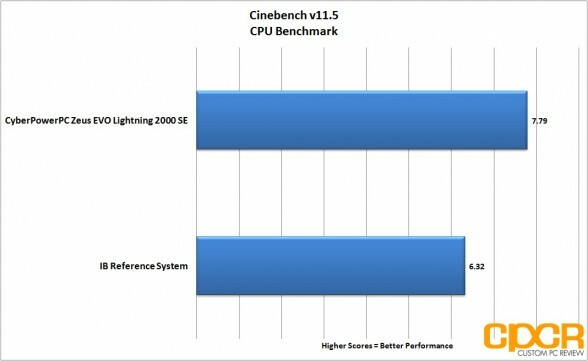 Pricing on the CyberPowerPC Zeus EVO Lightning 2000 SE configuration reviewed today is expected to be around $2069, which I think is a bit too pricey at the moment. Unfortunately, the Zeus EVO Lightning 2000 SE is so new that a configurator/order page currently isn’t available for it yet, so it’s difficult to pinpoint where the costs are racking up, but I’m told that a lot of the cost is due to the FX-9590 processor. That said, from what I can see, performance is definitely there and for a lot of gamers, the AMD FX-9590/AMD 7970 GHz Edition combo should be more than enough for now and some time to come; however, ideally I’d like to see this system priced around the $1,600-$1,800 mark. 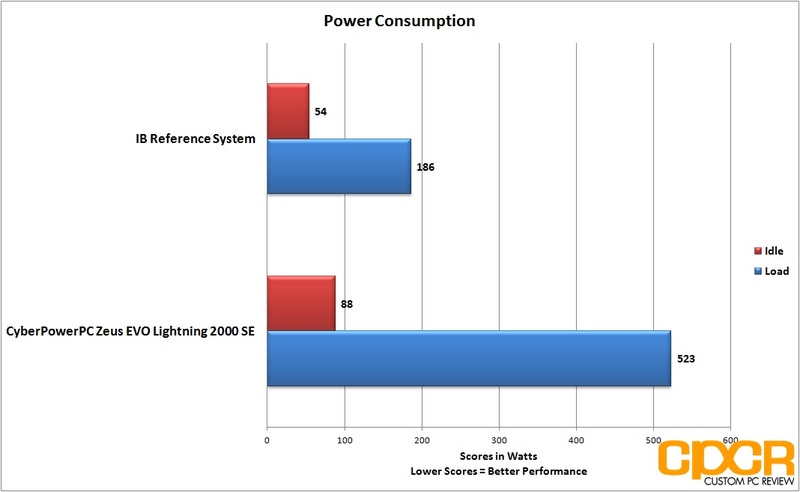 Either way, the CyberPowerPC Zeus EVO Lightning 2000 SE is a powerhouse system, and if a good deal can be found or you simply don’t want anything to do with Intel, I really can’t find any reason not to recommend it.